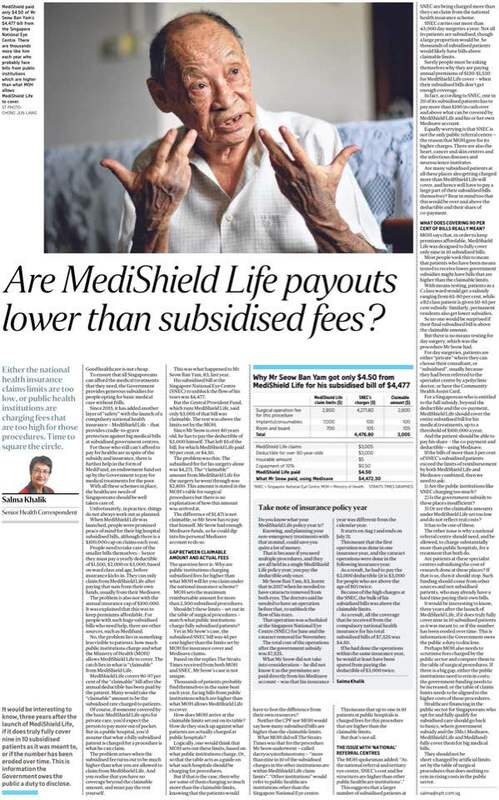 If Only Singaporeans Stopped to Think: Are MediShield Life payouts lower than subsidised fees? Logically, one would think that MOH sets out these limits, based on what public institutions charge. Or, so that the table acts as a guide on what such hospitals should be charging for procedures. But if that is the case, then why are some of them charging so much more than the claimable limits, knowing that the patients would have to foot the difference from their own resources? Neither the CPF nor MOH would say how many subsidised bills are higher than the claimable limits. What MOH did tell The Straits Times was that for the procedure Mr Seow underwent - called dacryocystorhinostomy - "more than nine in 10 of the subsidised charges in the other institutions are within MediShield Life claim limits". "Other institutions" would refer to public healthcare institutions other than the Singapore National Eye Centre. This means that up to one in 10 patients at public hospitals is charged fees for this procedure that are higher than the claimable limits. The MOH spokesman added: "As the national referral and tertiary eye centre, SNEC's cost and fee structures are higher than other public healthcare institutions'." This suggests that a larger number of subsidised patients at SNEC are being charged more than they can claim from the national health insurance scheme. SNEC carries out more than 43,000 day surgeries a year. Not all its patients are subsidised, though a large proportion would be. So thousands of subsidised patients would likely have bills above claimable limits. Surely people must be asking themselves why they are paying annual premiums of $130-$1,530 for MediShield Life cover - when their subsidised bills don't get enough coverage. In fact, according to SNEC, one in 20 of its subsidised patients has to pay more than $100 in cash over and above what can be covered by MediShield Life and his or her own Medisave account. Equally worrying is that SNEC is not the only public referral centre - the reason that MOH gave for its higher charges. There are also the heart, cancer and skin centres and the infectious diseases and neuroscience institutes. Are many subsidised patients at all these places also getting charged more than MediShield Life will cover, and hence will have to pay a large part of their subsidised bills themselves? Bear in mind too that this would be over and above the deductible and their share of co-payment. WHAT DOES COVERING 90 PER CENT OF BILLS REALLY MEAN? MOH says that, in order to keep premiums affordable, MediShield Life was designed to fully cover only nine in 10 subsidised bills. Most people took this to mean that patients who have been means tested to receive lower government subsidies might have bills that are higher than the claimable limits. With means testing, patients in a C class ward would get a subsidy ranging from 65-80 per cent, while a B2 class patient is given 50-65 per cent subsidy. Similarly, permanent residents also get lower subsidies. So no one would be surprised if their final subsidised bill is above the claimable amount. But there is no means testing for day surgery, which was the procedure Mr Seow had. For day surgeries, patients are either "private" where they can choose their consultant, or "subsidised", usually because they had been referred to the specialist centre by a polyclinic doctor, or have the Community Health Assist Card. For a Singaporean who is entitled to the full subsidy, beyond the deductible and the co-payment, MediShield Life should cover the entire subsidised bill for his medical treatments, up to a threshold of $100,000 a year. And the patient should be able to pay his share - the co-payment and deductible - using Medisave. 1) Are the public institutions like SNEC charging too much? 2) Is the government subsidy to these places insufficient? 3) Or are the claimable amounts under MediShield Life set too low and do not reflect real costs? It has to be one of these. The other issue is why a national referral centre should need, and be allowed, to charge substantially more than public hospitals, for a treatment that both do. Are patients at these specialist centres subsidising the cost of research done at these places? If that is so, then it should stop. Such funding should come from other sources and not subsidised patients, who may already have a hard time paying their own bills. It would be interesting to know, three years after the launch of MediShield Life, if it does truly fully cover nine in 10 subsidised patients as it was meant to, or if the number has been eroded over time. This is information the Government owes the public a duty to disclose. Perhaps MOH also needs to scrutinise fees charged by the public sector and compare them to the table of surgical procedures. If there is a big gap, either the public institutions need to rein in costs; the government funding needs to be increased; or the table of claims limits needs to be aligned to the higher costs of these procedures. Healthcare financing in the public sector for Singaporeans who opt for and fully qualify for subsidised care should go back to basics, where government subsidy and the 3Ms (Medisave, MediShield Life and Medifund) fully cover them for big medical bills. They should not be short-changed by artificial limits set by the table of surgical procedures that does nothing to rein in rising costs in the public sector. Do you know what your MediShield Life policy year is? Knowing, and planning your non-emergency treatments with that in mind, could save you quite a lot of money. That is because if you need multiple procedures, and they are all held in a single MediShield Life policy year, you pay the deductible only once. Mr Seow Ban Yam, 83, learnt that in 2017 when he needed to have cataracts removed from both eyes. The doctors said he needed to have an operation before that, to unblock the flow of his tears. That operation was scheduled at the Singapore National Eye Centre (SNEC) for June and the cataract removal for November. 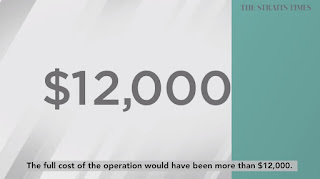 The total cost of the operations after the government subsidy was $7,525. What Mr Seow did not take into consideration - he did not know it as the premiums are paid directly from his Medisave account - was that his insurance year was different from the calendar year. It starts on Aug 1 and ends on July 31. This meant that the first operation was done in one insurance year, and the cataract operations were done in the following insurance year. As a result, he had to pay the $3,000 deductible (it is $3,000 for people who are above the age of 80) twice. Because of the high charges at the SNEC, the bulk of his subsidised bills was above the claimable limits. As a result, all the coverage that he received from the compulsory national health insurance for his total subsidised bills of $7,525 was $4.50. If he had done the operations within the same insurance year, he would at least have been spared from paying the deductible of $3,000 twice. The Singapore National Eye Centre (SNEC) will revise its fees on March 1 to ensure they remain affordable, the centre and the Ministry of Health (MOH) said in letters to The Straits Times Forum Page yesterday. The letters are in response to the case of patient Seow Ban Yam, 82, whose MediShield Life payout of just $4.50 was the subject of an ST report and commentary that attracted strong comments from readers. "SNEC recognises that it could do more frequent cost reviews to close prevailing gaps between current cost burden of patients and what it charges for financial sustainability," said its chief operating officer Charity Wai. "With the latest review of SNEC's charges to better align a wider range of procedures with Medisave and MediShield claim limits, patients requiring complex operations of higher surgical table codes will see reduced charges, including that which Mr Seow underwent." In its letter, MOH said that SNEC's charges are being reviewed to ensure they remain affordable, including for operations such as the one Mr Seow underwent to unblock the flow of his tears. "We stress that no Singaporean will be denied essential healthcare treatment due to inability to pay,"said Ms Lim Siok Peng, director of the ministry's corporate communications division. "The Government provides significant subsidies of up to 80 per cent to keep healthcare costs low, and all Singaporeans are protected against large healthcare bills through MediShield Life." 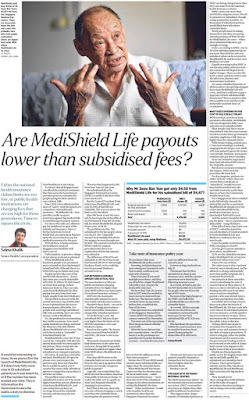 The articles, by ST senior health correspondent Salma Khalik, threw the spotlight on the disparity between subsidised surgical fees and the claimable amount from MediShield Life. Mr Seow's subsidised bill at SNEC for surgery to unblock the flow of his tears was $4,477, but only $3,005 was claimable. Being over 80 years old, he had to pay the deductible of $3,000. That left $5 of the bill - of which 90 per cent, or $4.50, was paid for by MediShield Life. SNEC, in its letter, said that the surgery Mr Seow underwent - a duct drainage operation - is uncommon, with only seven cases out of the 42,000 procedures it performed in 2017. ST's commentary had questioned whether a national referral centre should need, and be allowed, to charge substantially more than public hospitals for a treatment that both do, and asked if patients at these specialist centres are subsidising the cost of their research. SNEC said that its budget for research and education is funded separately by government grants, philanthropy and other income totally unrelated to clinical revenue from subsidised patients. The commentary also asked whether public institutions like SNEC are charging too much, if the government subsidy to these places is insufficient or if the claimable amounts under MediShield Life are set too low and do not reflect real costs. We refer to Ms Salma Khalik's commentary (Are MediShield Life payouts lower than subsidised fees? ; Jan 4). When MediShield Life was launched in 2015, the claim limits were set to cover nine out of 10 subsidised bills. Based on latest available figures, eight in 10 subsidised bills were within the MediShield Life claim limits, and nine in 10 were within $230 of the claim limits. The remaining bills tend to be those of a more complex nature or were cases which involved higher income patients who received lower means-tested subsidies. Overall, MediShield Life provides Singaporeans with protection against large bills, with affordable premiums. In particular, having a deductible for each year and a co-insurance borne by the patient, ensures that MediShield Life remains sustainable, and premiums kept affordable. Even with the co-payment, MediShield Life, in tandem with Medisave, allows for eight in 10 subsidised hospital bills to be paid with $100 or less in cash, and seven in 10 are fully paid without any additional cash outlay by the patient. In some cases, however, the patient's co-payment can be high. In most of these cases, the procedure would not have been a straightforward one. In Mr Seow Ban Yam's case, for instance, the procedure he had to undergo (bilateral dacryocystorhinostomy) is uncommon and complex, and was performed by a senior consultant. There is an ongoing review of claim limits, and the consequential impact on premiums, to ensure that MediShield Life's coverage remains broad-based and sustainable. The review will be completed by end 2020. In the meantime, patients who face financial difficulties can apply for assistance such as Medifund to ensure that healthcare remains affordable. In the case of SNEC, its charges are being reviewed to ensure they remain affordable, including for operations such as dacryocystorhinostomy. SNEC will introduce these fee revisions from March 1. We stress that no Singaporean will be denied essential healthcare treatment due to inability to pay. The Government provides significant subsidies of up to 80 per cent to keep healthcare costs low, and all Singaporeans are protected against large healthcare bills through MediShield Life. Patients can pay for the co-payment part of their bills with their Medisave. Medifund and various forms of financial assistance at our public institutions are also available for those in need. The Singapore National Eye Centre (SNEC) reviews and makes adjustments to its charges periodically to strike a balance between cost recovery and patient affordability. The cost for the most common procedures, such as cataract and glaucoma surgery, are closely monitored to ensure patients can pay with Medisave and make minimal cash outlay. As a tertiary referral centre, less common but complex cases, with high risk of complications, would require the expertise of senior and experienced surgeons. Such surgery requires longer operating time. For Mr Seow Ban Yam's case, a duct drainage operation was required for both eyes. The surgery took three hours. Duct drainage surgery is not common. Of the 42,000 procedures SNEC performed in 2017, there were only seven such cases. Research and training are important pillars of SNEC's mission. Its budget for research and education are funded separately by government grants, philanthropy and other income totally unrelated to clinical revenue from subsidised patients. SNEC recognises that it could do more frequent cost reviews to close prevailing gaps between current cost burden of patients and what it charges for financial sustainability. With the latest review of SNEC's charges to better align a wider range of procedures with Medisave and MediShield claim limits, patients requiring complex operations of higher surgical table codes will see reduced charges, including that which Mr Seow underwent. SNEC will introduce the fee revisions from March 1. No patient requiring care, whether for simple or complex conditions, will be denied treatment due to an inability to pay. Our staff are able to advise on the various government financial assistance schemes for patients who need them and these are further supplemented by philanthropic funds raised by SNEC for needy patients. Mr Seow Ban Yam, 83, is delighted at the Singapore National Eye Centre's (SNEC) decision to review and adjust its charges. "This will help many other people," he said. He had gone for surgery to unblock the flow of his tears in 2017. His subsidised bill came to $4,477, but MediShield Life covered only $4.50 of it. He found the insurance cover "ridiculous", and wrote to the Central Provident Fund Board to ask if there had been a mistake. According to his calculations, MediShield Life should have paid more than $1,300, or about 10 per cent, of the bill, after the deductible of $3,000. But the board told him there was no mistake. The reason for the low insurance payout was that the subsidised bill from the SNEC was 50 per cent higher than the claim limit for that procedure. After his case was highlighted in The Straits Times, SNEC chief operating officer Charity Wai said the centre will introduce fee revisions from March. This will "better align a wider range of procedures with Medisave and MediShield claim limits", she said. It would include reducing the charge for the treatment Mr Seow had gone for. She explained that the centre adjusts its charges periodically "to strike a balance between cost recovery and patient affordability". Ms Wai said that for common procedures like cataract and glaucoma operations, patients can pay with Medisave and need "minimum cash outlay". While the full rate would have set Mr Seow back by more than $12,000, his bill after subsidy was $4,477. Like all Singaporeans, he is covered for big medical bills by MediShield Life. Before the insurance kicked in, he had to pay the first $3,000, and did so from his Medisave account. That is the annual deductible for people aged above 80 years. 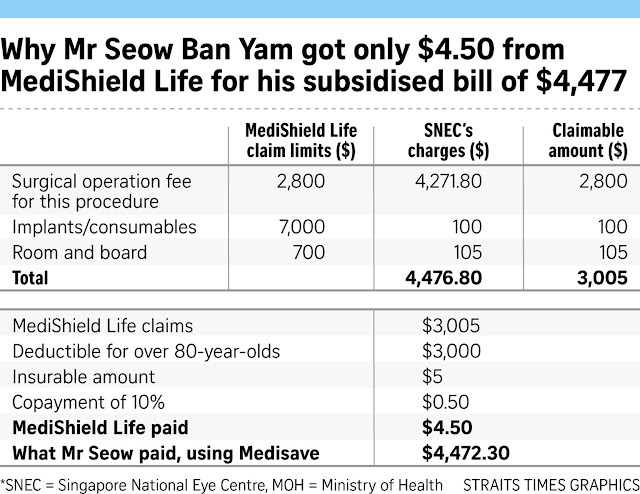 Mr Seow expected MediShield Life to cover 90 per cent of the rest of the bill. But the national insurance paid only $4.50. On the disparity between what Mr Seow paid and what he was reimbursed, a Ministry of Health (MOH) spokesman said: "MediShield Life claim limits have been sized to cover nine in 10 of subsidised bills to balance between providing assurance to patients and ensuring affordability of premiums." Nevertheless, the ministry said it will review claim limits and premiums by the end of 2020, "taking into account actual claims experience and healthcare cost inflation". MOH scrutinised Mr Seow's bills and said that at other public hospitals, the bills for more than nine in 10 subsidised patients undergoing the same procedure as Mr Seow are within MediShield Life claim limits. "As the national referral and tertiary eye centre, SNEC's cost and fee structures are higher than those at other public healthcare institutions," the MOH spokesman said. She added that in view of SNEC's higher costs, "MOH will continue to work with SNEC on funding and review its costs and charges to improve patient affordability". Mr Seow, a former businessman who ran his own business selling books to schools till he retired in 2015, had gone to SNEC to have cataract operations done on both eyes. He was told there was a blockage to the flow of his tears that needed to be corrected first. The government subsidy for the surgery was $7,559, leaving him with a bill of $4,477. Since MediShield Life requires people to pay for smaller bills, it does not cover the first $3,000 each year. After that was paid, the remaining amount was $1,477. Mr Seow's understanding was that MediShield Life would foot 90 per cent of it. But the national insurance scheme has set claim limits for different types of procedures, based on a table of surgical costs set by the MOH. The procedure Mr Seow underwent has a cap of $2,800 from MediShield Life, although the SNEC charged him $4,272 for it. Apart from the surgery, the insurance also covered the cost of his one-night stay and "consumables" which totalled $205. The Central Provident Fund Board said the maximum reimbursable amount was $3,005. Since the first $3,000 each year has to be paid by the patient, that left $5 of the bill that was claimable from insurance. MediShield Life paid 90 per cent of that, or $4.50. Mr Seow had to pay the remaining $1,472 himself. Said Mr Seow: "The whole idea of MediShield Life is to meet heavy bills. I don't understand why it is limited to $2,800 when the bill is more than $4,000. This defeats the purpose of insurance." The MOH spokesman said: "The amount not covered under MediShield Life can be paid using Medisave. Patients who face difficulties affording their bills can apply for Medifund." Medifund, however, applies to only the poorest. Mr Seow did not qualify as he was able to pay the bill with his Medisave money. The SNEC told The Straits Times that after using Medisave to pay bills not covered by MediShield Life, only one in 10 of its subsidised patients needs to top up more than $100 in cash. Ms Irene Png, chief financial officer of the SNEC, said that as a tertiary eye centre that sees more complex cases, SNEC has "cost and fee structures (that) are higher than those at other public healthcare institutions". She said Mr Seow's case was complex and needed a senior consultant supported by a specialised team. "The three-hour operation was done in the major operating theatre and was followed by post-operative monitoring and care. The higher fees charged were for the complex tertiary care that Mr Seow received," she added. Dr Chia Shi-Lu, head of the Government Parliamentary Committee for Health and an orthopaedic surgeon, said: "Either the reimbursement limits for various procedures need to be raised or the MediShield Life cover needs to be raised to reflect the increased cost of these procedures." But beyond that, he said, "we should not lose focus on the principle of first trying to keep costs down to ensure we are getting value for money". MediShield Life was launched in 2015 to provide Singaporeans with peace of mind from cradle to grave should they face big medical bills, even with subsidies. There is an annual deductible of $1,500 to $3,000 before the insurance kicks in, to ensure that the insurance is used only for large bills. This amount is cumulative for the insurance year. MediShield Life then covers 90 per cent for the first $5,000 of subsidised bills in the year. The coverage is 97 per cent for total bills that exceed $10,000 a year. The maximum claim limit is $100,000 a year, but there is no limit on the amount of claims a person can make in his lifetime. Patients who seek non-subsidised treatment can also get cover from MediShield Life, but the reimbursement is based on subsidised rates. Claim limits protect MediShield Life from excessive claims. How about protecting patients' share too? 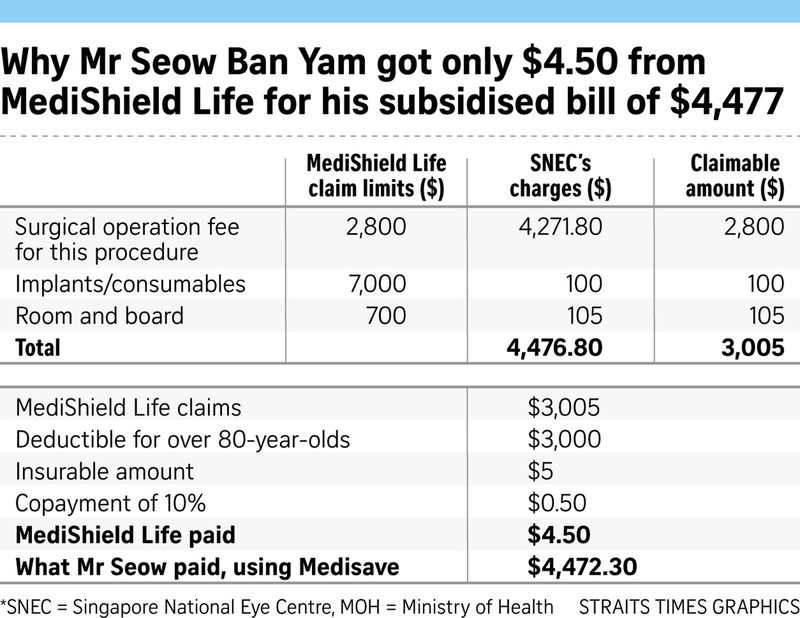 The recent fracas over the small insurance payout for a complex operation at the Singapore National Eye Centre (SNEC) ("MediShield Life paid just $4.50 of senior's $4,477 post-subsidy bill"; The Straits Times, Dec 31, 2018) has shone the spotlight on the adequacy of Singapore's national health insurance scheme. When MediShield Life was launched in 2015, the Government anticipated that, in exchange for higher premiums, Singaporeans could expect to "reduce co-insurance rates from the current 10 to 20 per cent to 3 to 10 per cent" if using subsidised healthcare services. However, in this case, it was not to be. 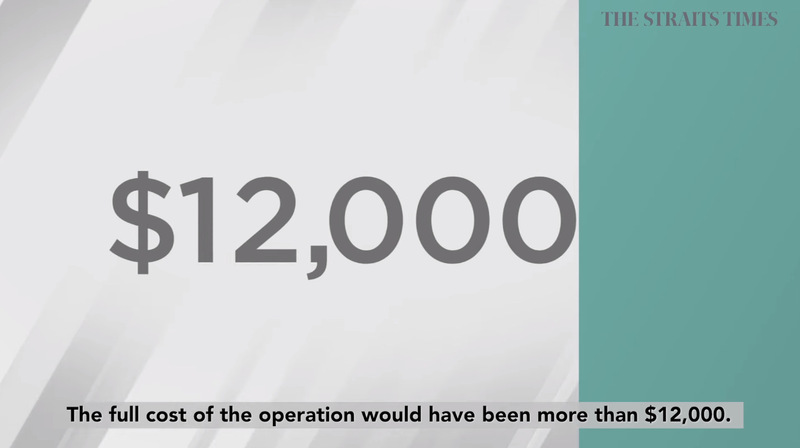 The total bill was over $12,000 but after government subsidies, it came to $4,477. Of this amount, most of it was paid using the patient's own Medisave, which is an individual health savings account. The national insurance plan MediShield Life paid $4.50. In response, the Ministry of Health (MOH) said:"When MediShield Life was launched in 2015, the claim limits were set to cover nine out of 10 subsidised bills. "Based on latest available figures, eight in 10 subsidised bills were within the MediShield Life claim limits, and nine in 10 were within $230 of the claim limits." Nonetheless, it said that it would conduct a review of claim limits and premiums by end-2020. The SNEC explained further that the case was complex and required a three-hour operation, hence the higher charges. Reactions have been heated over this issue, with questions raised over whether MediShield Life payouts are too low even for subsidised bills, and whether SNEC and other national health centres such as the cancer, heart and skin centres are charging too-high fees that are above MediShield Life claim limits. But it is useful to take a step back and examine three "hard truths" behind national health insurance schemes. Just as Goldilocks' ideal porridge was not too hot and not too cold, MediShield Life has to straddle a fine line to achieve both financial and political sustainability. The scheme has to be designed to financially endure for decades, meaning that premiums must be greater than claims and anticipated claims. However, it must also pay out sufficiently so that citizens' out-of-pocket expenses are affordable. Affordability here is nuanced - what is deemed affordable at the peak of one's career and income would be very different from a retiree's notion. Failure to strike that right balance in either direction is disastrous. Constant deficits and the scheme will eventually collapse. But too tight-wadded a philosophy, and more and more instances of modest payouts way smaller than the actual bills, and Singaporeans will lose the "peace of mind" that was a key motivation behind MediShield Life in the first place. MOH has often repeated its pledge that MediShield Life claim limits are meant to cover nine in 10 of subsidised bills. But increasingly, one has to ask if that is enough. If there are half a million claims a year, 10 per cent of bills not covered could amount to at least 50,000 - not a small number. Expectations are understandably high for a compulsory scheme. My view is that the scheme has to work not at 90 per cent, but at 99.9 per cent. I think Singaporeans are reasonable enough to understand that no policy or scheme can cover every situation. But Singaporeans can and should expect that the rare case which falls through the cracks is identified proactively with speedy and fair resolution. It cannot be that Singaporeans who dutifully follow the Government's advice to seek subsidised care and trust the Government's assurances that MediShield Life offers "Better Protection. For All. For Life", then have to appeal for what should rightfully be expected. The stark reality is that insurance is about uncertainty and someone or some entity needs to take on this risk. In MediShield Life, this risk is arguably stacked against individual citizens. There are claim limits such as $100,000 per year in total and $200 for Table 1 (less complex) procedures. These claim limits serve to "protect" the scheme from too-large payouts. But there is no equivalent maximum limit to likewise "protect" citizens' exposure to large bills. In some national health insurance plans overseas, patients' maximum out-of-pocket expenses are capped per year, and amounts above that are drawn from the insurance or other state fund. But the reality is that we cannot fully protect both the scheme and citizens. When it comes to very large bills, someone has to pick up the tab and bear the risk - MediShield Life, individual citizens or some other state-supported fund. With this background, what can we learn from the SNEC episode? First, the public expectation as suggested by the furore is that MediShield Life should pay out a substantial proportion of the total amount that patients have to pay. The public may not understand sub-limits or the need for them. The public just wants "peace of mind"; the confidence that in public-sector healthcare institutions, we will be clinically well taken care of; and that financially, Medisave, MediShield Life and some modest out-of-pocket payments will be all that are needed. The assumption that public hospitals price subsidised care reasonably is a fair one, as is the assumption that MediShield Life claim limits are sized to what patients need to pay. After all, the MediShield Life website states "MediShield Life payouts are pegged at B2/C-type wards in public hospitals". The fact that the SNEC case was complex and required a three-hour procedure is no reason for a small payout. This is exactly the sort of care episode MediShield Life should be designed for. Second, MediShield Life is a new scheme and cases such as this are to some extent inevitable. What then matters is identifying them early, applying human judgment on the appropriateness of the payout based on the existing rules and whether to override. And after addressing the specific case, review and determine whether there are lessons that can be applied system-wide, so that everyone can benefit. MOH has said it would conduct a review by the end of next year, but with more than $1.5 billion already paid out to over 200,000 Singaporeans, surely there is enough experience to start identifying gaps and improving the scheme? Health Minister Gan Kim Yong previously assured Singaporeans that while "hiccups" were unavoidable, MOH would "do our best to fix them as quickly as we can". Asking the public to wait two years may not be palatable. Like it or not, public confidence in MediShield Life has been shaken by this episode. The goodwill generated during the build-up back in 2014, including the Government's earlier announcement of almost $4 billion in premium subsidies and other support, has been somewhat eroded. What can be done? That Singaporeans accept the need for deductibles and co-payments to prevent "moral hazard" or abuse is not in doubt, but should co-payments be open-ended, especially when MediShield Life has billions in reserves and administrators can raise premiums as needed? Just as claim limits "protect" the financial sustainability of the MediShield Life system, perhaps it is time for a serious discussion on whether there should be co-payment limits to "protect" the financial security of individuals and households, especially when there is a risk of financial hardship or, worse, bankruptcy from large medical bills. "Peace of mind" is central to the success of MediShield Life. Perhaps some form of cap on the proportion of the total bill that patients pay should be explored? Or a cap on co-payments by patients? Many other countries design their national insurance schemes to include both, including the Austrians, the Finns and the Germans. MediShield Life is a key pillar of our national healthcare financing framework. Mr Gan, speaking in Parliament in 2015, described the MediShield Life scheme as "the embodiment of Singaporeans' aspiration for a more inclusive, caring and progressive society". We cannot let trust in this vital institution be weakened further and I hope the Government will move decisively to restore confidence. Dr Jeremy Lim is partner, Health and Life Sciences Practice, Asia-Pacific in consulting firm Oliver Wyman. When compulsory national health insurance MediShield Life was launched in 2015, it was designed to fully cover the big bills of nine in 10 subsidised patients. Aside from the deductible - the amount a patient has to pay each year before insurance kicks in - and the 3 per cent to 10 per cent co-payment for the rest of the bill, Dr Chia asked: "Does this mean that two out of 10 have out-of-pocket expenses?" He told The Straits Times that if the claim limits are exceeded for more than 10 per cent of patients - which appears to be the case now - "then the claims criteria will have to be reviewed". He said that during the parliamentary debate before the launch of MediShield Life, the Ministry of Health had said claim limits were based on data for the previous decade. "This may not be an accurate reflection of needs and costs today," he added. Questions on the adequacy of MediShield Life cover have also been filed for the Parliament sitting on Monday, he said. Earlier this week, a letter from the ministry revealed that the number of subsidised patients with big bills who are not fully covered by MediShield Life has doubled over the past three years, and now stands at two in 10. Ms Lim Siok Peng, MOH's director of corporate communications, said in the letter: "Eight in 10 subsidised bills were within the MediShield Life claim limits and nine in 10 were within $230 of the claim limits." Claim limits are set by the ministry for more than 2,500 procedures and cap how much from MediShield Life and Medisave can be used to pay for the treatment. More can be withdrawn from Medisave than can be covered by MediShield Life. Ms Lim added that together with Medisave, eight in 10 patients needed cash payments of $100 or less for their subsidised bills. The Straits Times had highlighted the plight of Mr Seow Ban Yam, 83, whose insurance paid only $4.50 of his $4,477 subsidised bill. The low coverage was due to his Singapore National Eye Centre bill exceeding the claim limits by more than 50 per cent. Ms Joan Pereira, also a member of the GPC for Health, said the actual percentage of patients getting full cover could be lower than expected due to differences in the profile and illnesses of patients compared with initial projections. She added: "Hence there should be adjustments to the claim limits to take into account the current profile of illnesses (and average costs in public hospitals) so that more can receive full coverage by MediShield Life." It has been three years since MediShield Life was launched, she said, so "we should be expecting improvements in the coverage for claims going forward as tweaks are being made to the... scheme". Ms Lim said there is an ongoing review of claim limits and the consequent impact on premiums, but it will be completed only by the end of next year. When MediShield Life, the only health insurance for one in three people here, was launched, the MOH promised no changes on premiums and benefits for five years. At that time, Health Minister Gan Kim Yong said MediShield Life "will be a major milestone in reshaping our social policies to provide every Singaporean with lifetime basic protection against medical costs and give him greater peace of mind". Dr Chia, an orthopaedic surgeon at Singapore General Hospital, said that from his experience, there are few issues with MediShield Life cover and "we seldom encounter affordability issues any more". But he added that there are gaps in health insurance, such as those encountered by Mr Seow. The Ministry of Health (MOH) will review more regularly the claim limits that cap MediShield Life coverage and Medisave payments - around every three years or so. Senior Minister of State for Health Edwin Tong yesterday promised more regular reviews when he addressed in Parliament the issue of how a patient received only $4.50 from MediShield Life for his subsidised bill of $4,477. Currently, the plan is for the limits to be reviewed every five years. 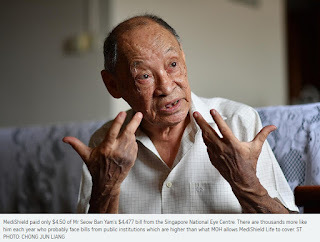 Mr Seow Ban Yam, 83, had undergone surgery at the Singapore National Eye Centre (SNEC), and his subsidised bill was about $1,400 above the MediShield Life claim limit. His case was first reported in The Straits Times. Mr Tong said the MOH will redouble its efforts to keep healthcare costs sustainable and affordable, and also "keep a close watch on public healthcare costs". He said that should the current review exercise, which started last year, be completed ahead of time, the revisions will be announced earlier. Such a review "requires a careful assessment of the appropriate claim limits and also the consequential impact it may have on premiums, to ensure that the coverage of MediShield Life remains broad-based and sustainable". Mr Tong was responding to Ms Tin Pei Ling (MacPherson) and Mr Murali Pillai (Bukit Batok) on whether MediShield Life provides adequate coverage. He told the House that MOH had asked the SNEC to review its charges, and the centre has decided after a review to scale down its fees for the procedure Mr Seow underwent, as well as for a number of other complex procedures that are higher priced, from March 1. The number of subsidised bills that are within MediShield Life claim limits has fallen from nine out of 10, to eight out of 10. Mr Tong explained that one reason for this is increased healthcare costs. But even so, about half the bills that top the MediShield Life claim limits do so by $230 or less, he said. Without claim limits, the premiums for MediShield Life, which insures people based on subsidised rates, will go up significantly, by 30 per cent or more, he added. "Rather than impose this on all Singaporeans across the board, those who prefer to have higher coverage and are willing to pay higher premiums can consider private Integrated Shield Plans, which can include 'as-charged' features that cover 100 per cent of the bill," he said. Mr Tong also promised that in reviewing claim limits, "we will ensure that they are in tandem with the cost" and that they also track inflationary cost for the healthcare sector. Workers' Party Non-Constituency MP Leon Perera asked if there were "pertinent common characteristics" for the 10 per cent of subsidised bills that bust the claim limits by more than $230. Mr Tong said these were largely the more complex cases, with "patients who don't pass the means test for subsidies" forming a sizeable component. Do public healthcare institutes check with the ministry when setting their prices, asked Mr Pillai. To this, Mr Tong said there are "several hundred thousand bills", so it is not possible for the MOH to look at every bill. But there are guidelines and benchmarks that the ministry will constantly look at and keep within a range that fits in with the philosophy of MediShield Life, he said. He also promised: "We will continue to review, refine and strengthen MediShield Life and other components of our public healthcare financing system, and just as importantly, manage our healthcare costs to ensure that public healthcare remains affordable for all Singaporeans."